Neo Technology, creators of Neo4j, the world’s leading graph database, today announced the agenda for its inaugural GraphConnect 2012. 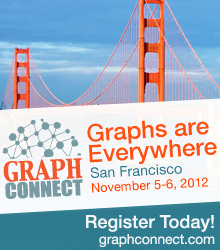 Taking place on November 5-6 at the Hyatt Regency San Francisco, the conference brings together the rapidly growing community and ecosystem around graph databases and is intended for attendees of all technical levels. The event features a full day tutorial and talks from leading experts in the field. Summary: This talk will take you through the experiences we had at Accenture with Neo4j. Using this graphdatabase, Accenture experienced unique benefits and challenges within the typical IT project life, going from proposal to architecture, design, development and operations. This session will cover every phase and discuss the key differences to more traditional approaches most enterprises take. Summary: Data is accumulating rapidly. Our approaches to capturing and analyzing data, as well as in making connections between and drawing conclusions from this data, are evolving as well. Rebecca Parsons offers a review of some of the changes in how data is used and analyzed, highlighting several examples of the power of data analysis outside of the usual suspects: customer needs, production dashboards, etc. GraphConnect 2012 is sponsored by Heroku, SpringSource by VMware, ThoughtWorks, and Accenture. The event will conclude with a party on November 6th at Sens Restaurant, sponsored by ThoughtWorks. Join us for great food, drinks and the announcement of winners for ‘The Graphies’ Awards. Take advantage of the early bird special by registering before September 30th.